Start Date: Monday April 6. Details: EVERYONE CAN and SHOULD do this challenge! It doesn’t matter if you have 1 or 50 consecutive push-ups, or whether you are on your toes or your knees: this challenge will make you better! Find a partner that can keep you accountable, and monitor full depth / range of motion on your push-ups – preferably someone who consistently works out at the same time as you. Neither of you have to be on the same level of push-ups. Standards to uphold: full elbow lockout at the top of every rep, chest touches the ground, hips and shoulders lower and rise at the same pace (aka staying in tight plank entire time). Our goal is to have your elbows go back and down, staying close to the body. We will have weekly assignments and mini challenges for you to follow along with. Challenge: Can you increase your max consecutive push-ups after four weeks? Blue group – tabata high plank – complete 1 push-up at the end of every 20 sec interval. If you need to go from the knees, please do so. Orange group – tabata high plank – complete 2 push-ups at the end of every 20 sec interval. -roll out the front and back of your shoulders with a lacrosse ball. complete a 30 sec high plank into a 15 sec low/forearm plank. -5 Sets of X number of push-ups. Pick a moderately difficult number and do for all sets. 1 minute rest between sets. (for example: if I completed 20 consecutive push-ups in the first test on Monday, I would choose 12-14 for this challenge). Join Coach Emily this Thursday night April 9 from 7-8pm for our first Mobility Class! This first one will be free and is open to all members! TorqueNation Muscle-Up Clinic coming in May! Work with Coach Ali over 5 weeks to get that muscle-up! Whether you are working on your first one, or working on linking them together; this clinic is for you! 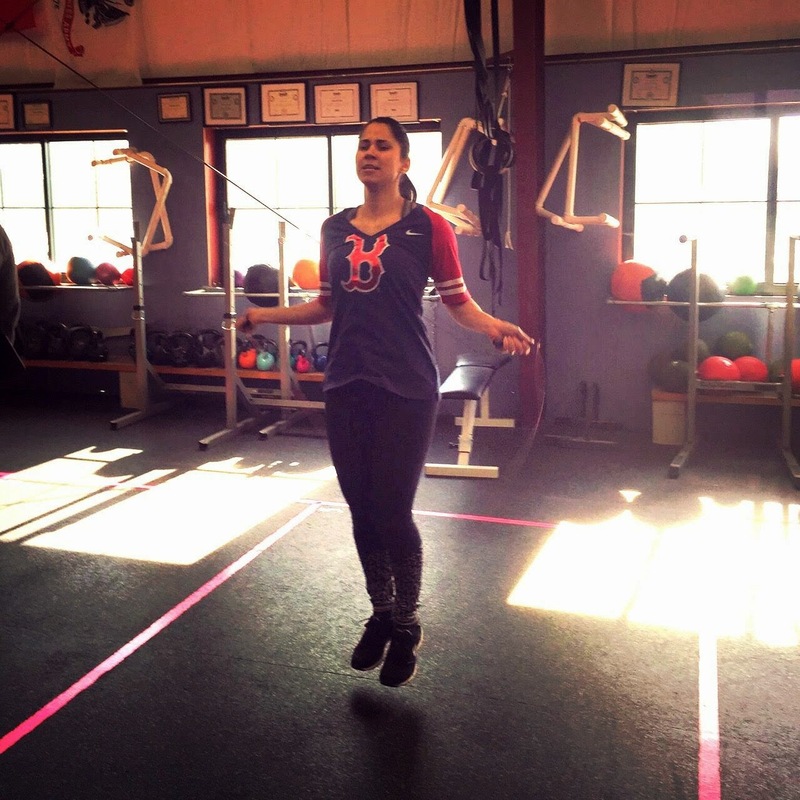 She will work with you on an individual basis to teach and perfect the muscle-up technique during Tuesday’s classes. And on Thursday’s classes, you will be heavily focusing on building the strength needed. Prerequisite: at least one kipping chest-to-bar pull-up. Please talk to Coach Ali if you are unsure this clinic is right for you! Signing-up: must email CFT.Amanda@gmail.com and it will be a first come first serve basis based on approved conversations. Hurry – this will sell out fast! January was Rowing. February was Shoveling (everyone was a winner). March was Double-Unders. April will be…..
More specifics will be announced this coming Monday night! Winners of March 2015 Double-Under Challenge! Congrats to PRs & Poptarts! Team Carey and Juliana for winning the March 2015 Double-Under Challenge! Combined, they completed 5,725 double-unders in March! Wow their calf muscles must be on fire! Let’s be sure to celebrate all of the successes from this challenge! Juliana went from ‘single single double’ to a new max of 52 in a row! Barnet went from having ‘single single double’ to now 16 in a row! Diana went from 15 to a new max of 80! Patty went from 5-8 in a row, to now consistently hitting 40+! Deija & Jen also hit consecutive dubs – what were your numbers ladies?! And there are plenty more examples! Proof that practice, hard work, and determination pays off! 15 teams participated, jumping over 36,744 double-unders!